Alma Porciuncula has been leading DAI’s work in the Philippines on innovative financing for water supply and sanitation projects, policy, and regulatory and utility reform since 1994. Under her stewardship, a U.S. Agency for International Development (USAID) technical support program helped establish the Philippine Water Revolving Fund. She has had the privilege of steering the development of the fund from conceptualization and feasibility assessment through design and implementation. The fund, a credit financing facility that leverages public with private commercial bank funds, thereby augmenting scarce public resources, has changed the water funding paradigm by bringing in sustainable, market-based financing. 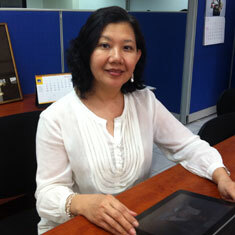 Alma has done development work for more than 30 years, starting as a transport economist for the Philippine Government and later serving as a consultant for the World Bank, Asian Development Bank, and USAID projects, where she specialized on public-private partnership (PPP) policy and program development as well as infrastructure financing. Among her notable experiences in this field are her project management leadership of the Philippine BOT Program and the Gujarat, India PPP Program, where she led the drafting of the state’s build-operate-transfer (BOT) law and the institutional strengthening of the state agency tasked with appraising and approving PPP projects.